TruTac has presented Carlsberg with two awards in recognition of its high fleet compliance levels. 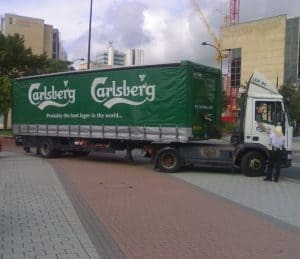 One of the ways Philip Thompson, fleet manager at Carlsberg UK, helps his transport managers stay on top of the latest regulations and how those affect the strict operational KPIs he sets, is by holding regular O Licence meetings. As well as discussing best practice and looking at the results from the numerous key areas by which operations compliance is monitored, the team’s achievements are reviewed against internal benchmarks to ensure everyone is performing to their maximum potential. The latest meeting was held at the offices of Carlsberg’s accident management partner Sopp+Sopp in Peterborough on November 8 and covered areas including tachograph analysis, driver training style and accident prevention and management.